Okay, so it isn't exactly the EEE, XO or classmate PC but the Zonbu Notebook is right up there with the three competing for the cheapest notebook in the market. 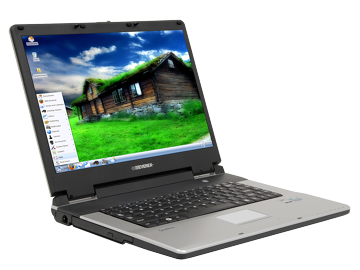 The Zonbu Notebook has a 15.4 inch widescreen display, 1.5 GHz VIA processor, 512MB memory, 60GB hard disk drive, DVD-ROM/CD-RW optical drive, and VIA Chrome9 HC IGP graphics card. Connectivity options on the Zonbu Notebook includes 3 USB ports, Ethernet port, and built-in 802.11 b/g WiFi. The Zonbu Notebook is made by EVEREX and weighs only 2.4 kg. So why is the Zonbu Notebook so cheap? Well, like the EEE, XO, and Classmate PC, it doesn't rely on the Windows Operating System or Microsoft Office, instead, it has 20 of the best open source applications. Aside from the $279 hardware price, you will also need to pay a $14.95 monthly service plan for the Zonbu Notebook. This covers services for online backing up of data, free tech support and maintenance of the operating system. For those who're new to computers, this will probably be a good choice and Zonbu's service plan will eliminate any headaches that comes with troubleshooting a notebook.